Cornbread is just a staple in the South. There aren’t many meals that aren’t perfectly complemented by a golden brown skillet of it. That said, we do have our variations. And Hot Water Cornbread is one of them. 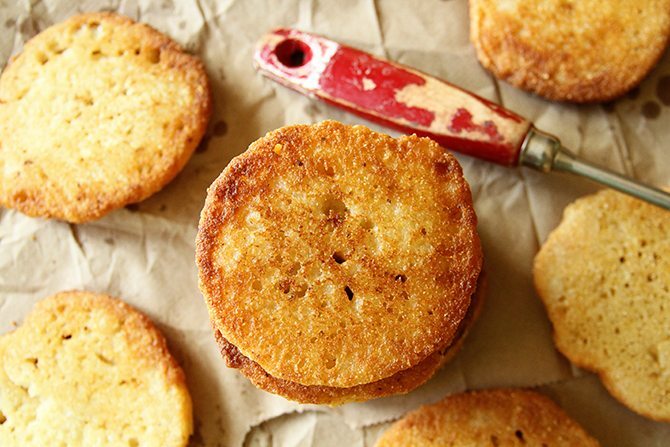 We Southerners do “fried” cornbread several ways. My mama always made what she called “Fried Cornbread” which was a most delicious cornbread made with cornmeal and buttermilk that you simply fried. It was a constant alongside homemade vegetable soup and often made an appearance beside chili too. It’s also great to pile some greens or beans right on top of. This is another variation, which produces a little bit lighter textured bread. Now, there are 100 different ways to do this. Some recipes call for you to make a thick dough and form it in your hands before frying. I think this method with a pourable batter easier, neater, and I like the crispy exterior better. The recipe calls for self-rising cornmeal. That’s what my mama has always used, so that’s what I use. However I realize it’s not readily available across the country (and dare I say world), so I’ve added a note to the recipe on how to make your own. Y’all enjoy! Pour about 1/2 inch of oil into a heavy-bottomed skillet. Heat the oil to about 350° or until glistening but not smoking. In a large bowl combine the self-rising corn meal with about 1 1/2 cups of boiling water. Carefully stir to combine. The batter should be pourable. Add additional water until you reach the consistency of thick pancake batter. Different corn meals will require different amounts of water. Start with less and add more if you need it. Once the oil is hot, pour about 1/4 cup of the batter into the oil. Cook 3 to 5 minutes or until brown around the edges then carefully flip over and cook an additional 3 to 4 minutes. Work in batches, adding additional oil if necessary. Drain the cornbread on a plate lined with paper towels. Serve warm. For every 1 cup of self-rising cornmeal: Start with 1 cup of finely ground plain corn meal in a bowl. Remove 1 tablespoon of the cornmeal and return it to the bag. To the bowl add 1 tablespoon baking powder and 1/2 teaspoon salt. Mix together. This is the way my Mama always made her Hot Water Cornbread! She never would let me get close enough to see just how she did it because she was always afraid I’d get burned by the hot water splatter even when I got much older she was still afraid I’d somehow get burned. Of course like many of our Mamas, she didn’t have a written recipe, just what was in her head so I never knew the amounts. Thank you so much for this and I am definitely going to make some this weekend to go with some good old beans! Many thanks again for all your wonderful recipes and stories. I have your great cookbook as well as I have given several to my friends and they equally love the book as do I. Thanks so much, Claudine! Your support means more than you could ever know! Claudine, what is the name of the cookbook you are talking about? I would like to buy one. Gosh! How could I have forgotten! Can’t wait to fry some up to go with my mess of catfish. Wow Stacy, you’ve brought back so many memories with this recipe. Thank! Favorite of my family except add Mexican corn. OOOooh adding Mexican corn would be so pretty. Nice to have a variation although I do like the original a whole lot! I Love Hot water corn bread and milk. I also like to put cracklins in it . and pat it into patties and fry. I use self rising cornmeal and about a forth cup of course cornmeal. Pour Hot water in it. I am 82 so I make it the poor peoples cornbread. I Love it. Fit for a king or queen! In my humble opinion! Thank you! Have got to try it! my dad used to feed it to the chickens on his farm. Thanks for sharing!!! I have always loved fried cornbread… I am originally from N.C., and love to add some cooked fresh collards (drained, of course) to make collard sandwiches!!!! Also, just love to eat crispy cornbread by itself!!!! This kinda blew my mind! What an AMAZING idea! I’m totally making collar sandwiches! Omg! That idea sounds absolutely delicious!! Reminds me of growing up in the Deep South! Childhood memories..going to make some this weekend a pot of collard greens! Thank you! What a fun post this is! And a coincidence, too. Last evening I cooked black-eyed peas, hot water cornbread, potato salad and fried chicken for supper. When summertime comes, I’ll add sliced homegrown tomatoes to this favorite meal. I grew up in East Texas, and our family recipe is the same as yours, but with the addition of an egg. Though our home is now in Santa Fe, New Mexico, and we love the wonderful food here, my sweetest memories are of the meals my mother and grandmother cooked for our family. 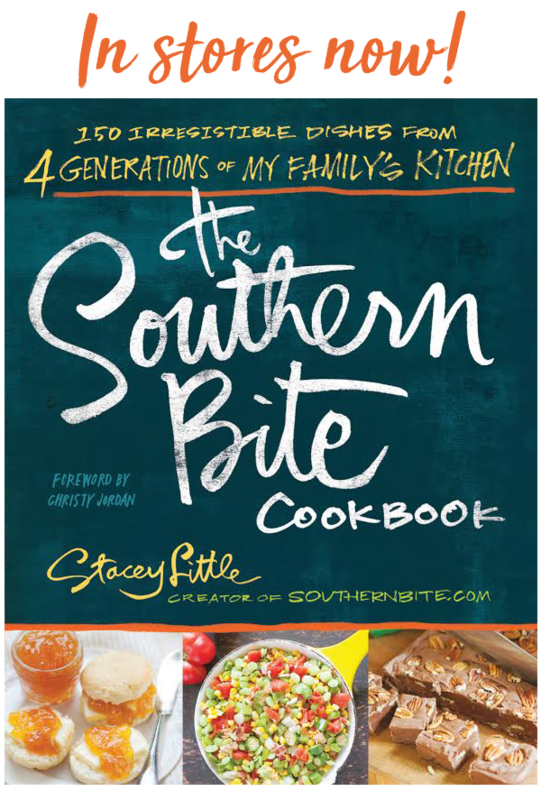 Thank you, Stacey, for carrying on a great tradition with the recipes you share. I don’t put egg in the hot water cornbread but I do put egg when I cook cornbread in the oven. Thank you! Stacey! Will be having this, um…, probably daily! at least! SoretaMyrick gave me one idea and it lead to another and another for add ins could be infinite! Now I know how to make it! Can you make hush puppies out of this. My husbands aunt from Gallitin Tenn made hush puppies she put hot water in the the cornmeal grated onion they were made in little balls I live in Weatherford Tx they were just like Long John Silvers a fast food chain here. You’ll want a little thicker batter for hush puppies, so add a little extra cornmeal and it’ll work perfectly. That’s Gallatin TN. My hometown. I put minced onion is mine also but just make a patty and fry. The hot water cooks the onion. Also good with sour cream mixed in the batter. My Mother fried her cornbread. One of my favorite meals, and one I always asked for when I would return to visit was fried cornbread and corned beef and cabbage. Not the long cooking kind – the quick fixing chopped cabbage and can of corned beef kind. Takes me back everytime I make it but it is never as good as when Mama made it. Your website is wonderful. I totally agree, Bennie. My grandmother made it the same way. It holds a special place in my memories. Thanks for your kind words. Gosh! I just loved when my Granny would make fried cornbread, pinto beans, and collard greens. Seriously, nothing better. I could almost smell them frying when I looked at your pictures. Thanks for sharing!! Thanks for the kind words, Lisa! Hope you’ll try these and love ’em! What’s the healthiest oil to fry it in without changing the taste? I’m not sure about healthiest, but canola and peanut will all work. I’ve heard some people have success with coconut oil, too. That’s what we used last night, coconut oil, refined. Amazing, just amazingly good. Definition of good food. Thank you for the yummy taste of the south Stacey, spread the love. So glad y’all enjoyed them!!! I’ve never seen it done this way, can’t wait to try your recipe. My Mama is always having me make her a small batch. I make it like she does, like her Mama did before her. Ours is equal parts flour and cornmeal, a pinch of salt, boiling water added to make a thick batter. About a tablespoon formed into football shapes and fried until crisp. I’ll take fried cornbread just about any way I can get it! Hope you’ll enjoy this version too. Oh, Stacey….soooo good. I, too make corned beef from a can to go with your hot water fried cornbread. I put a handful of diced onion in a skillet, open the can of corned beef, add a few diced red potatoes, add chopped fresh garlic and a half a cup of good red wine. (cover) If you need more liquid, use up to 1/4 cup water. I, also, do turnip greens and mustard greens mixed with your cornbread. OMG….so wonderful. We also like homegrown butter beans or peas with this cornbread recipe. Nothing better. 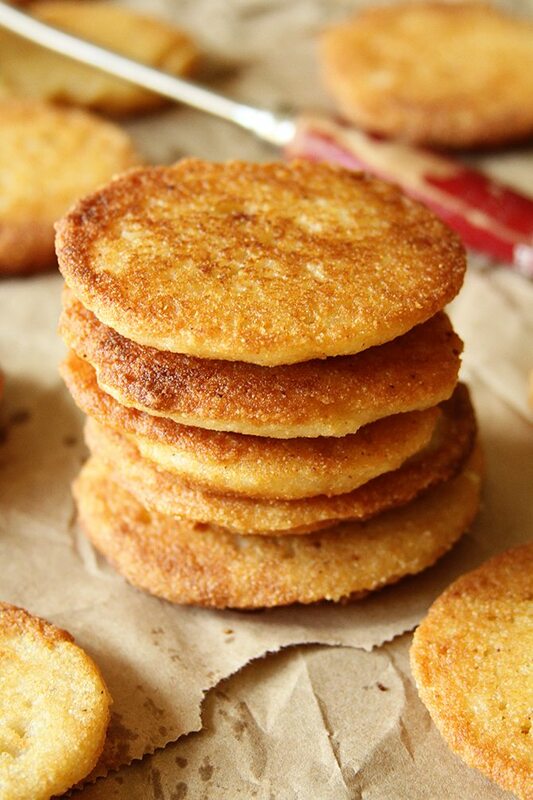 Gosh…I do believe we have had your hot water fried cornbread everyday for lunch or supper. We are not tired of it YET! Talk about nostalgia. Brought tears to this foolish old woman’s eyes. Thanks for the memory. Aww… so sweet! Hate to make you cry, but so glad it brought back memories. This recipe did not work for me at all. I followed your instructions very closely and all I got was a big goopy mess in the pan. I can’t imagine what went wrong, but something sure did. Oh, no! Was it too soupy? If so, adding some more cornmeal to get it to the right consistency is all you have to do. I tried to be very specific about consistency because different cornmeal will require different amounts of moisture. My mouth is watering so much right now! This isn’t how my mama made it but it looks almost like hers. She used twice as much cornmeal (self-rising) as flour, the amount depended on how many people were here to eat, lol. Then she added a little salt and water. That’s it, so simple and soooooooooooo good. You fry it up and have a feast, lol. I like it just by itself. I think I’m gonna try your recipe and see how it tastes…it sure looks wonderful! Thank you so much for sharing with us! It is made from the dough of scratch buttermilk biscuits and pressed into a cast iron frying pan. Slaves called it hoe cakes. Our little family cookbook has a recipe almost just like this (along with a story about how my great-grandmother made it on a wood stove). I never had the nerve to try it, but after reading your post I think I will. I love, love, love! any kind of cornbread except that icky sweet stuff that comes in a box. My husband only liked the kind in the box! But when I made fried cornbread in patties, in a little more grease than I should have, he scarfed it up, ’cause he loved that crunch! (Except for that yukky sweet stuff in the blue and white box, I cook all my cornbread on top of the stove, like a pancake. When it’s half done, I flip it over and cook the other side. I can’t tell the difference between that and baked. Lately, though, when I’ve made beans, I’ve made Indian fry bread (as in American Indian, like my husband) That’s his all-time FAVORITE way to eat beans! And I have to admit, it’s almost as good as cornbread and beans. Almost. Could you use a box of jiffy mix instead? Yep, but you’ll need to adjust the water amount. How much water if you use jiffy mix? I made these tonight to go with some leftover chicken salad. The whole family LOVED them. We then turned them into a dessert by smothering them with honey. So yummy. Awesome! So glad y’all enjoyed them!! I would like to try this recipe. I like sweet bread. How much sugar could I use? I’d start with a few teaspoons and add more to taste. Can you use Jiffy cornbread mix instead? I’ve never tried that, but by adjusting the liquid amount, it should work just fine. Stacey, I just found your site and I look forward to reading more! Welcome! Hope you find lots you enjoy! I’m thinking this might be good slathered with butter and maple syrup. I’ve always made cornbread with just water (room temp) and self-rising cornmeal. I tried it with the boiling water to see what the difference was, and it was a mess for me lol! Mine usually turn out looking just like your photos, but after adding the hot water, it spider-webbed out across my oil as it cooked and stayed mushy in the center. I have no idea what went wrong! Have you ever made it with room temp water? Did you notice any difference in the finished product? Hot water tends to give the leavener in self-rising cornmeal the immediate heat it needs to give the cornbread lift. In your case, I think maybe there was too much liquid in your batter. Stacey, thank you so much for this recipe! I’ve heard of hot water cornbread before, but I hadn’t tried it until tonight. I had it with soup beans (pinto), fried potatoes, homemade sauerkraut and a big slice of sweet onion. Needless to say, I am stuffed! Sounds like a perfect meal to me! Glad you enjoyed it! Sounds like maybe your oil wasn’t hot enough, Christian! That or you didn’t allow them to cook long enough before flipping them. Sorry to hear you had trouble! My sisters and I have been searching out a way to make fried cornbread for years, literally years. Our grandmother mixed, shaped fingers with the batter and fried, but NEVER told us or showed us how to actually make them from start to finish. All we know is she used white cornmeal. 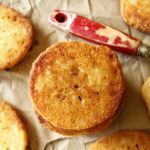 What would need to be done to get them to look like the fingers she made us as children – soft and moist on the inside in a coat of crispy brown goodness? I would imagine she had a similar batter and just spooned it into a log shape right into the hot grease. Wouldn’t it be great if we all had the forethought to be able to capture those recipes before they were gone! Good luck!! I make the cornbread like your grandmother. I use only white cornmeal and salt in a bowl adding very hot water (almost boiling) until I have a moist batter just barely stiff enough that can be picked up and pattied, definitely not a pourable batter. The batter will be very hot to work with. Make a patty between your two hands. This will give the finger marks. Place in the pan of hot oil. You can cool your hands with cool water between making patties. It make take a couple of batches to learn the right consistency. That’s why we all learned by watching our mamas make this bread. An elderly couple I know used to make fried cornbread all the time, exactly the way you made yours. They ate it drizzled with molasses. It was delicious. I like mine slathered in butter. I like the butter method, too! used to make this when she was alive many years ago and it was delicious! Thank you for posting this! 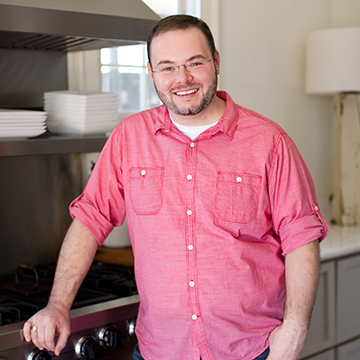 Love your recipes and always look forward to each blog from you! My mother-in-law made hers into little logs, like someone mentioned above, the ingredients are the same except she used much less liquid so that the batter was more like a dough, she would take a spoonful in her hands and simply roll it into a small “log” and then she deep fried them until golden brown. The only difference between her recipe and yours was the amount of liquid and the fact that she used white cornmeal and she added her own baking powder, salt, etc. We had a June apple tree in out backyard and the apples weren’t good for much more than making fried apples with. 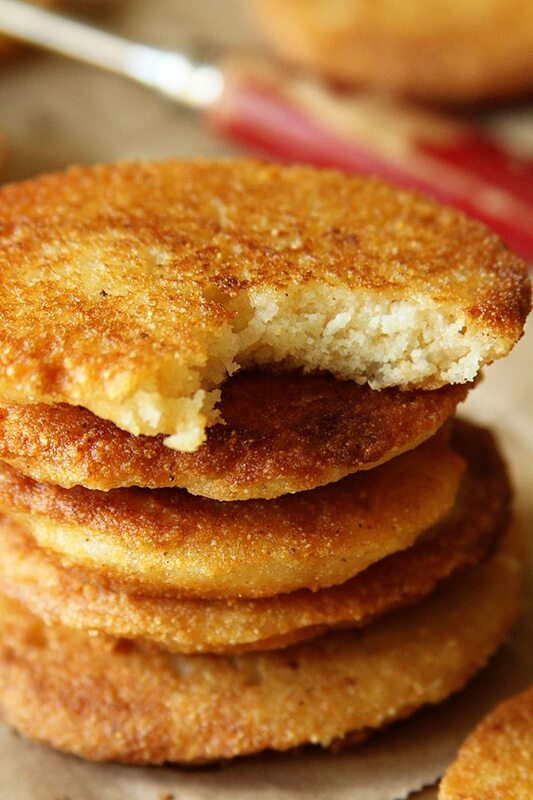 So any time we had fried apples, mama always made fried cornbread and it was so good. I also love it with sorghum poured over it. Nothing better than cornbread with sorghum. Man, you just took me back to being a kid and going fishing with my papa on the burn out bridge in Texas. My Grandmother would always pack me a nice bag of her Hot-Water Cornbread, some fresh cracklins and a link of some Boudin. Thank you and may God continue to bless you. Now that sounds like a sweet fishing trip! I love how food can connect us to those amazing memories! I used Martha White self rising buttermilk corn meal mix, my batter was pretty thick. When I put it in hot oil it came apart and reminded me in taste and texture of The crumbles on the food fromLong John Silver. I poured most of the oil off and added an egg and finely got something that resembled your picture. They were good and went with my ham and beans. Seem like you batter was too dry. When you say you poured most of the oil off, what do you mean? These were so great!! My dad used to make fried cornbread, but never the same way twice. I just switched to using cast iron for cooking and was reminded that I always wanted to make his crunchy cornbread. I followed your recipe and measured the temp of the oil before frying ( I used bacon grease) and they were exactly like yours in the picture. They even cooked in the same amount of time, which is always a relief for me, and rare for some reason when I follow someone else’s recipe. My whole family is from the south and it means a lot to raise my girls on the good stuff. I added finely diced onion and they were SO good and easy to make. Thank you for posting. I’m so glad to hear they worked out perfectly for you! So glad y’all enjoyed them!! Onion is a GREAT addition! Just made this….added about two tablespoons butter, It was AWESOME!!! Yum! Glad it turned out great for you! This is perfection! I’ve tried others and they were never quite right. So good and so very easy!! I’m so glad that this one worked for you! Can I use Jiffy Corn Muffin mix instead of Corn Meal, and will it change the texture or taste of the corn bread? You can, but it will certainly change the taste.